How to wear hijab with maxi -As summer approaches, every women looks forward to buy new clothes and follow new fashion trends. Summers is all about colours and designs. If you wear a hijab then you need to select a dress that looks amazing with the colour of your hijab fabric. 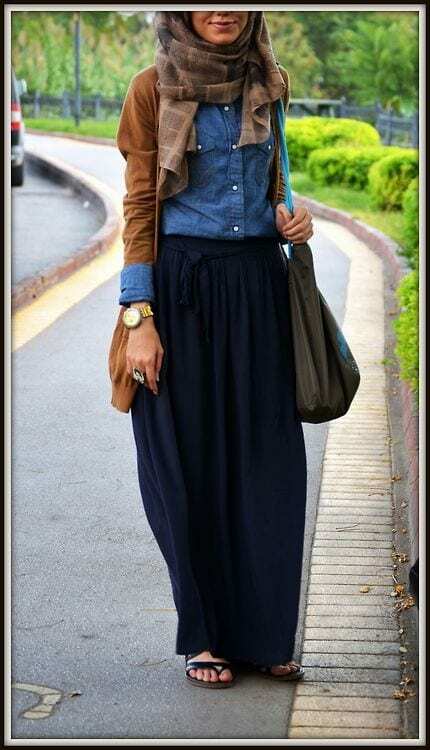 There are many fashion trends of hijab for summer but the latest one is hijab style with maxi dress and skirts. Check out the modest maxi dresses styles below that will show you brilliant ideas how to wear it. Maxi skirts are perfect wear for summer and spring season.Where hijabis feel quite uncomfortable wearing hijab with other outfits ,maxi is the best choice.We have already covered a great ideas for hijabis that what outfits to wear with hijab in summers to stay cool.And for winter season you can also style scarf with maxi dresses.There are plenty of options in that too.Most popular trend include wearing it with denim and leather jackets .Many top muslimah bloggers prefer this style for cool weather. If you plan to attend a party or a wedding event then the first thing you need to make sure is the dress that would be appropriate to wear on that following day. For women who take hijab, should wear a dress that makes them look modest and modern together. For this, maxi dress style is the most classy one to wear. Other than the dress, a maxi style skirt could be worn with a shirt. Ladies if you want to get inspired with the exclusive maxi styles then you must keep the following points in mind. There are do’s and don’t of wearing a maxi dress. Check them below. 1) What kind of fabric is it? Picking up the right fabric is very important for all of you. Silk and chiffon are great to wear and they look good. Don’t wear jersey fabric. It won’t look good. For a modest look you can wear a long maxi skirt or a dress. Floor length maxi dresses look beautiful. We have chosen the best styles for you all. Choose a well tailored top. To balance out the look, you must wear a well stitched top. Don’t wear anything that doesn’t suit you. Your body shape should look good and the top should be structured such that you look good. Choose the right hijab for yourself. When it comes to purchasing the hijab that matches your maxi ensemble, it becomes really tough. You need to know what would be the right combination of your maxi dress colour and hijab. Also you need to pick a wide material that is long enough to cover the front part of your dress. If you wear a printed maxi, you will have to make sure that the hijab you choose should be either solid or printed, but somethig that complements the dress. where is that skirt from?! These are definitely some ways that make you exactly modest. Such types of articles are actually what modern Muslim women need to read. To shop such types of dresses you should better search from online stores.